Spend a full day learning the art of flyfishing with K&K's experienced instructors. Extensive hands-on fly casting sessions are interspersed with lectures and discussions on trout foods, artificial flies, terminal and personal equipment, stream strategies, knots, leaders, fly presentation, mending, spey --- and more. 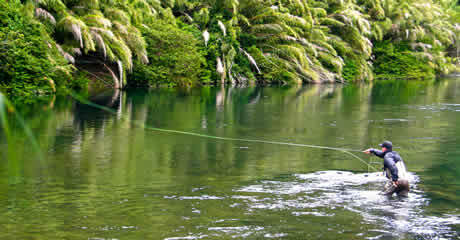 A complete A-to-Z Fly Fishing course. Cost is $85 per student, includes equipment, refreshments and lunch. Casting school held at the store - 8643 Grant, Overland Park KS. Class introduction begins at 9:00AM, followed by morning instruction until the lunch break at 12:00 noon. Afternoon instruction resumes until graduation at 3:00 PM. Call the store, watch this site and our Facebook page for schedule-change due to weather. Learn the craft of fly tying during our six-week, six-night course. A three-to-one student-to-instructor ratio insures that you quickly advance your tying skills. Each two hour class will cover the techniques to dress the type of fly that will wok on your favorite water. The history of each pattern that you will tie is discussed along with the method of fishing that particular fly. By learning to tie your own flies and understanding what your favorite fish feed on, you will become a more successful angler. $75 per student. All tools and materials are provided. We limit class size for a quality educational experience. If you cancel 30 days prior to the school date, you'll receive a full refund or date-change option. No refunds or date change options on cancellation notifications of 29 days or less.